Lyon boss Bruno Génésio has given some insight into his team's plans to stop Catalan giants Barcelona ahead of their Champions League round-of-16 clash next week. He also revealed what the team must do to stop the relentless Lionel Messi. The two sides are set to lock horns at the Lyon Olympic Stadium for the first leg next Tuesday and will take on the second leg at the Camp Nou next month. Barcelona captain Messi has been in phenomenal form since returning from injury, having found the net 21 times so far this season. The club's president Josep Maria Bartomeu had recently confirmed that a deal was being tabled for the 31-year-old, in a bid to tie him down with the Catalan giants for a few more years. Speaking to RKB (via Marca), he said, "Leo Messi will continue with us. He is a club player and the relationship will continue forever." 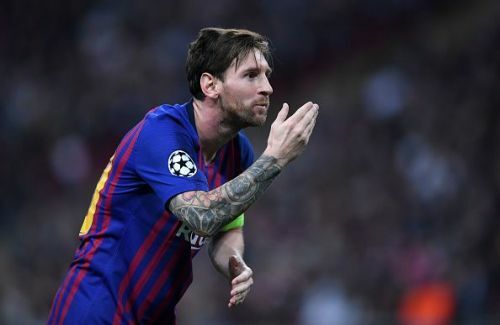 Lyon boss Génésio, who is well-aware of the threat that lies ahead of him in the form of Messi, has drafted a tactical plan that centers around the five-time Ballon d'Or winner. "The anti-Messi plan will be rather collective, where we will all have to respond. We will have to strengthen the midfield and the pressure around Messi. If you do individual marking to a man like him, at some point it will make a difference." "And then, there is another aspect. We must defend well when we do not have possession of the ball." Barcelona are currently at the top of the Spanish top flight, six points clear of second-placed Real Madrid, who have managed to claw their way up the stands in recent weeks. Meanwhile, Lyon sit at third place in the Ligue 1 table, 16 points behind table-toppers Paris Saint-Germain. The first leg of the Champions League Round of 16 clash between the two will take place on February 19.